Three of the Israeli power lines which provide electricity to the besieged Gaza Strip have been disconnected due to damages, the Gaza energy authority said on Monday. The energy authority said in a statement that Israeli power lines 9 and 8, as well as the line feeding Al-Shaaf area, were damaged and disconnected last week. Line 9 was reportedly disconnected at dawn on Tuesday, and the other two followed shortly afterwards. The statement added that Gaza’s electricity supply was suffering from power outages due to the closure of the Kerem Shalom crossing during the Jewish holiday of Rosh Hashanah, through which fuel is imported into the blockaded Palestinian territory. 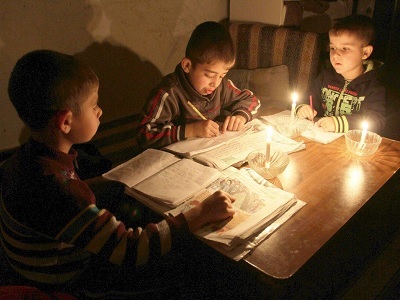 The Gaza energy authority added that it was trying its best to carry out maintenance to the damaged lines and use any fuel shipment that could enter the Gaza Strip to provide as much power as possible for the longest amount of time, while noting that Gaza’s power station was running on only one generator.